I have a confession to make: this blog may be called Sheila’s feel good blog but I don’t always feel good. In fact on a ‘Tigger – Eeyore’ scale of cheerfulness I veer towards Eeyore. I don’t bounce out of bed with joy and glee, particularly not in winter. It’s not the lack of sunshine that gets me, it’s the cold. And boy, has it been cold. I have very poor circulation: my blood seems to give up any attempt to reach my furthest extremities, it rarely ventures further than my elbows or knees! On really cold days I can be found wrapped in one shawl, whilst knitting another shawl, wearing a hat, fingerless gloves and warming my feet on a hot water bottle. 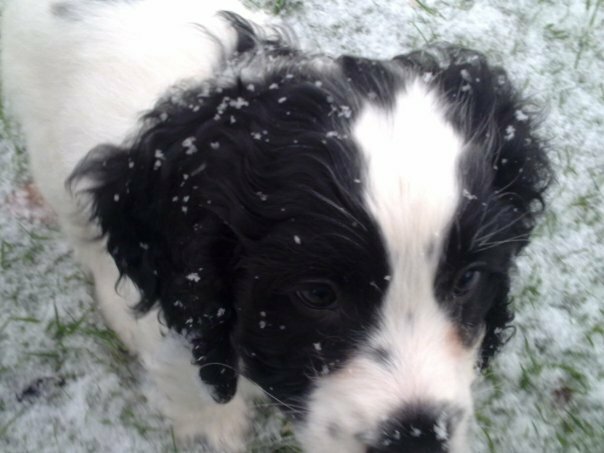 Given my low tolerance of cold, it was perhaps unwise to complicate my life by the addition of a puppy in deepest mid-winter. But that was when Bobby arrived. He was house-trained at the cost of long periods of time in my frozen garden, often at ungodly hours. Now that’s over, I still have to leap out of my bed before dawn and don at least 5 layers of clothes as our morning routine includes a thirty minute walk, come rain, shine, snow, sleet, hail, ice… and believe me all of those have come! I do love my dog and I’m not regretting his arrival in our lives but until the temperature reaches double figures our morning walk requires me to dress like an Eskimo: 3 or 4 layers on my torso, thermal long johns and trousers on my legs, 2 pairs of socks, 1 hat, one scarf and several pockets worth of tissues for the inevitable sniffy nose. It’s not a good look: snowman meets scarecrow, only without the straw. Even though the dog bit is self-inflicted that hasn’t stopped me doing rather a lot of complaining lately. In addition to enduring the weather I have ‘nursed’ an ankle injury all winter and chronic pain is really tedious, probably about as tedious as chronic complaining. Thankfully I can now at least walk, so long as I wear my arch supports or highly glamorous ankle brace. But after 4 months I realise the only thing I’ve actually nursed is a complaining spirit. So this post comes with apologies to all those who have had to put up with me moaning on. The other day in a shop I found a handbag mirror with the slogan I’ve used as the title for this post. I just had to buy it. What a fortifying attitude! As if that wasn’t enough that evening I read the following verse in my Bible ‘Do everything without complaining’ (Philippians 2:14) of course it said much more than that but those 4 words were quite specific enough. No room for manoeuvre on that instruction. So it’s Lent and given the ‘carb crave’ winter induces I probably should give up biscuits and chocolate but I’ve decided to go for something more fundamental, I’m going to give up moaning! You’ll have to hold me to this. And Lord, I’m really going to need some help with this one… if the weather could just get a bit warmer? NOT that I’m complaining! Day 2 of not complaining and it’s snowing!